Nothing makes you feel more helpless when your little one is sick. 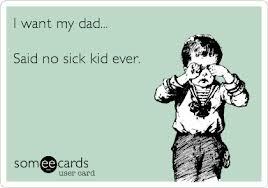 Both of my kids have been ill this week. So that mean extra cuddles. However being my kids they come with an extra dose of whining and crying. Is it just me or do the kids intentionally try to cough, sneeze or wipe their noses on the mom. I think I am easily the transporter of all the germs in this house. Everyday the towels are getting changed and the disinfecting wipes are dwindling. It is really enough to make me pull my hair out. So while comforting them I'm trying not to give into the whining. I can't help it when my hubby gets home that I want to hide from everybody for five minutes to collect my sanity.